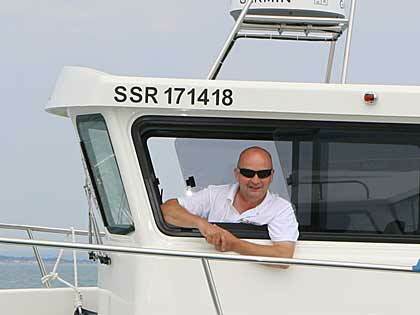 Dointhedo is a sea fishing charter boat based at Premier Marina Gosport, in Portsmouth Harbour. 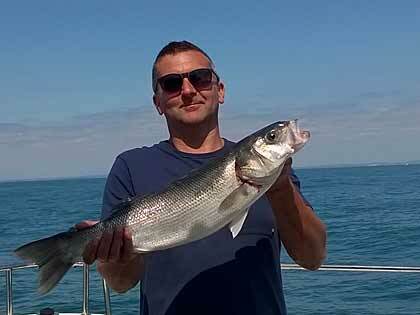 Whether you want a day fishing in the Solent, a day drifting around mid-channel wrecks and reefs, a pre-organised day, or a day searching out a new undiscovered place ... then we can cater for you with our brand new state of the art charter fishing boat. 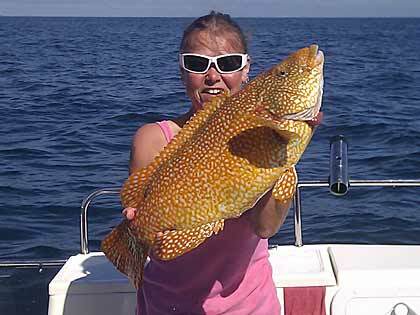 We welcome all anglers including families and supervised children. We can get you to your fishing spot safely and speedily, with a cruising speed of 30 knots and a top speed of over 40 knots enabling you to spend more time fishing and less time travelling. Equipment hire is available and angling tuition is also offered. 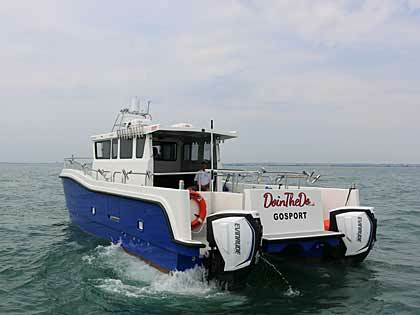 Dointhedo is a purpose built 11.4 Metre Swiftcat catamaran. It is fitted with up to date navigation and electronic equipment, and carries all the necessary safety equipment to satisfy its MCA CAT 2 Coding. Dointhedo is listed as wheelchair accessible. We are based and berthed at Premier Marina in Gosport and will pick up crews from numerous marinas along the South Coast; from Lymington , Southampton, Portsmouth, Southsea etc. The boat can accommodate up to 12 passengers for all types of fishing trips from short duration mackerel trips, through to 24 hour speciality trips. It benefits from a spacious full walk around wheelhouse and has plenty of sheltered seating. It has a clean toilet facility and easy access to the vessel via doors to both port and starboard sides. It is powered by the latest and most emission and environmentally friendly engines - 2 x 300HP Evinrude Etec G2s. The vessel is fitted with highly engineered bespoke hydrofoils which provide a stable platform at speed. For an unusual day out with the office crew or some valued customers why not step aboard Dointhedo and enjoy any of the services we offer. Take in a spot of sightseeing, fishing, and then berth in one of the numerous marinas for a spot of lunch. Entertaining clients? Rewarding Staff? Whatever your corporate day's requirements why not consider a day afloat as a change to the golf day. Read More. View the historic sights of Old Portsmouth from the unique perspective of the sailors that have used this port for hundreds of years. If you would like to venture further afield why not take a trip around the Isle of Wight, The River Hamble, Southampton Water or Beaulieu etc. We provide sightseeing tours encompassing the whole of the South Coast. Get the timing right and we may also be blessed with dolphin watching. Read More. Our spotlessly clean vessel is ideal for saying goodbye to your loved ones as you put them to their final resting place. You can choose the area, either close to shore or perhaps a site of special interest, such as the site where the Mary Rose was discovered. We can play music of your choice and you can raise a toast to the dearly departed as you scatter their ashes. All provided with the utmost respect. And with easy access to both port and starboard sides, there is no undignified clambering over rails to contend with. Read More. We can take you close to the action of the America's Cup or Cowes week or the F1 Power Boat events. Perhaps you would like some photographs of the huge American Aircraft Carriers that anchor outside Portsmouth Harbour, or a private platform to enjoy any one of the multitude of firework events. Whatever your request, we will be pleased to cater for your own clendar event. Read More. Dointhedo is a very stable platform for both filming and taking photographs. We can remain almost stationary or steam along at over 40mph. We can follow or lead other vessels for some great action shots. The deck is large enough for several tripods with plenty of room for other equipment. The Solent is always a hotbed of activity and Dointhedo can get you there fast and safely. Read More. Dointhedo is available for safety boat/guard boat work, whether it be to enforce exclusion zones or provide a platform for marshalling events, bathymetric surveys to water sampling, Dointhedo with its fast turn of speed and stable catamaran styling provides an ideal platform for majority of needs. Read More.